Günther Oettinger has secured a second term in office as Germany’s EU Commissioner in Brussels after winning support from the German coalition government on Monday (23 June). It is unclear yet whether he will remain Energy Commissioner. EURACTIV Germany reports. On Monday (23 June) the executive board of Germany’s centre-right Christian Democratic Union (CDU) unanimously voted for current Energy Commissioner Günther Oettinger to stay on as a member in the next European Commission. German Social Democrats (SPD) also backed the CDU politician for another term in Brussels. According to Udo Bullmann, chairman of the SPD representatives in the European Parliament, Oettinger is a “committed European” and deserves the position. As of yet, it remains unclear which policy area the former state prime minister of Baden Wurttemberg will be assigned to head up in the next Commission. “The allocation of portfolios must be cleared up with the future Commission president in due course”, explained government spokesman Steffen Seibert. “The fact that Mrs. Merkel has not determined a portfolio for Mr. Oettinger is smart. Because first a new Commission president must be chosen, and then the 28 heads of state and government must speak with him”, explained Herbert Reul, chairman of the CDU/CSU Group in the European Parliament, in a statement for EURACTIV Germany. Recently, British Prime Minister David Cameron called for a super-Commissioner post for his country. According to Cameron, such a Commissioner should oversee the internal market, competition, trade and energy portfolios. But Greens believe Oettinger will remain Energy Commissioner: “The fact that Angela Merkel is actually suggesting an extension for her Energy Commissioner Oettinger in Brussels is not a good sign for European energy and climate policy”, explained Rebecca Harms, co-chairman of the Greens in the European Parliament. Two years ago, the environmental NGO Greenpeace criticised Oettinger as a “flip-flopper”, accusing him of constantly changing his political opinion to follow favourable winds. “To this day, that has not changed. Oettinger continues to announce good decisions but then he does not transpose these into actions”, said Franziska Achterberg, Greenpeace expert for transportation and energy, speaking with EURACTIV Germany. Meanwhile, she said, Oettinger rightfully continues to indicate that improvements in the field of energy efficiency are inevitable. “But then, under pressure from German companies, he promotes softening CO2 limit values for passenger cars. In this way he is ranking German industry interests above his mandate as an EU Commissioner”, said the Greenpeace expert. Other observers are looking back on a remarkable development of the EU Commissioner. Five years ago, Oettinger’s appointment was a surprise in the executive body. Many German media reports accused the government of allowing itself to be taken advantage of regarding Oettinger’s placement. Critics claim Oettinger took on a weak portfolio and was not even given the vice presidency post. In addition, many had doubts over whether Oettinger was capable of working in a European context. Time and time again, the public made fun of the CDU politician’s lacking English language skills. “Oettinger could have refuted many of these prejudices. To a certain extent there is always criticism but for a broad majority of the population Oettiger rather exceeded expectations”, explained Severin Fischer, Europe expert at the German Institute for International and Security Affairs (SWP), in a statement for EURACTIV Germany. But Fischer objects to the criticism that Oettinger is serving German industry interests: “Other European member states do not perceive Oettinger as a representative of German energy policy. Instead, they see him as a neutral agent”, the SWP expert said. 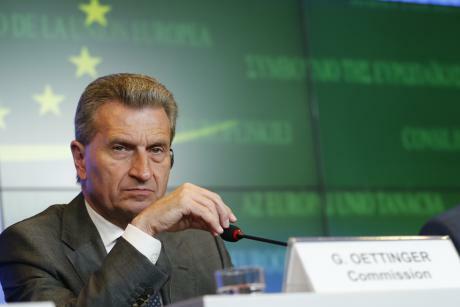 Oettinger had repeatedly been in conflict with the German government. “Oettinger has often criticised Germany for viewing the ‘Energiewende’ as a national project. He did not duck his head”, Fischer said. In his energy policy, Oettinger always insisted on European solutions, through which all Member States could gain, said Götz Reichert, energy expert from the Centre for European Policy (CEP). “Oettinger has proven to be a reliable Commissioner, who has quite intensively worked himself into different topics. He is always out there to explain his work transparently. He has acquired expertise in his field”, said Reichert. SWP expert Fischer expects “continuity” for European energy policy, should Oettinger become Energy Commissioner. “This is especially helpful in light of the complex issues. For example the debate on the 2030 targets, Oettinger has followed and influenced this discussion”, said Fischer. Now the member states are negotiating on these targets, but the Commission is an important mediator in the background. “Oettinger might be a good choice for that”, explained Fischer. According to Fischer, Oettinger will dedicatedly continue to pursue several topics such as the completion of the Internal Energy Market, since the project is currently stuck due to special national requests. In consultation with the newly elected president of the European Commission, the Council will name 27 designated Commissioners in September. Every Commissioner is assigned a specific portfolio. Each member state nominates a Commissioner. The European Parliament can only accept or reject the Commission as a whole. Amongst others the EU's 28 leaders will nominate a new Commission President next Friday during their summit in Ypres and Brussels. EPP 'Spitzenkandidat' Jean-Claude Juncker currently is the most likely to take over the post. On Friday (27 June) he could be approved with a qualified majority of member states. He would then have to be endorsed by an absolute parliamentary majority. the other week he looked so miserable I almost felt sorry for him – now I know why – Angie & Co have told him he has to stay in Bx for another 5 years. – over here, over paid & out of his depth.